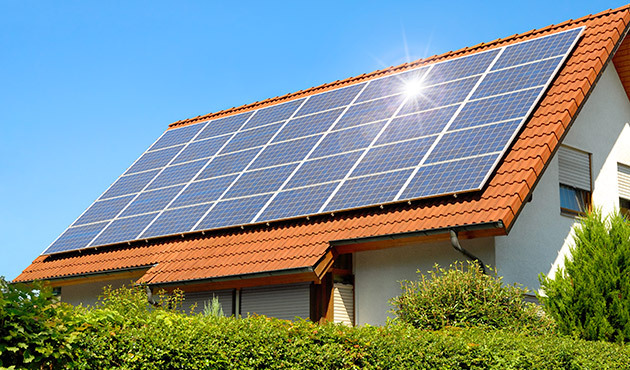 Solar electricity systems capture the sun’s energy using photovoltaic (PV) cells. The cells convert the sunlight into electricity, which can be used to run your organisation’s lighting and appliances. PV cells don’t need direct sunlight to work – you can still generate some electricity on a cloudy day. G.P.Green Ltd will design and install your solar photovoltaic system in accordance with the Microgeneration Certification Scheme (MCS) requirements ensuring that your panels are in the best position to take advantage of the light captured on the roof of your buildings. PV cells come in a variety of shapes and colours, from grey “solar tiles” that look like roof tiles to panels and transparent cells that you can use on glass. We only use fully MCS approved products and we are also members of the RECC Assurance Scheme, which is the consumers independent authority that governs sales and procedures in this industry. If you already have solar panels installed, we can also offer you maintenance checks to ensure everything is working properly.